Since Spring has sprung, we’re extra excited about truck books in our house! There are a few construction sites around town, and so we’ve been spending lots of time watching the trucks do their jobs. If you’re looking for a few more truck books to add your collection, check out my post here for a few suggestions! 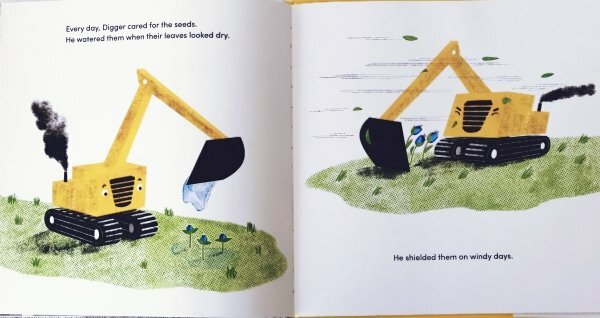 In this post, I put together a fun toddler sensory bin activity inspired by one of our favorite books ” The Digger and the Flower” along with a review of the book! 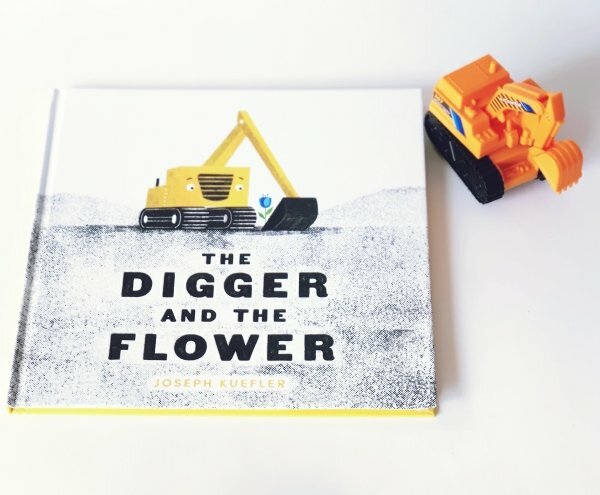 The Digger and the Flower is sure to warm the hearts of both environmentalists and truck lovers. 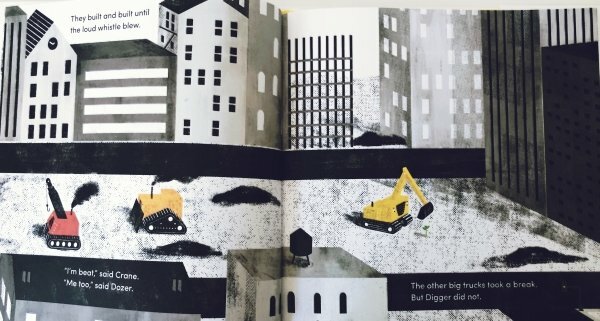 It’s a beautifully written story about an excavator truck that discovers a blue flower growing in the middle of his construction site, and vows to protect it. Vibrant and heartwarming illustrations will inspire readers to understand the value of friendship and the importance of caring for people/things that you love. It’s an inspiring tale that will definitely should be added to your book collection. 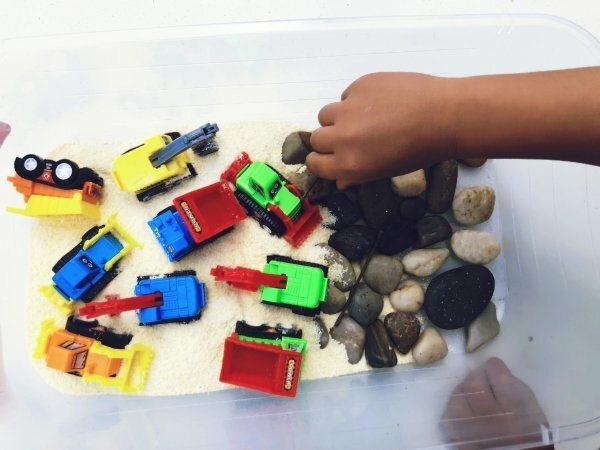 This super easy sensory bin project will keep your toddler entertained for hours of fun. Our toddler loved pushing the trucks around the bin, as well filling them with materials and dumping the contents. Fill up a clear container with assorted materials. Dig in for hours of toddler fun! You can refresh the bin each day to make it more enticing for your toddler. 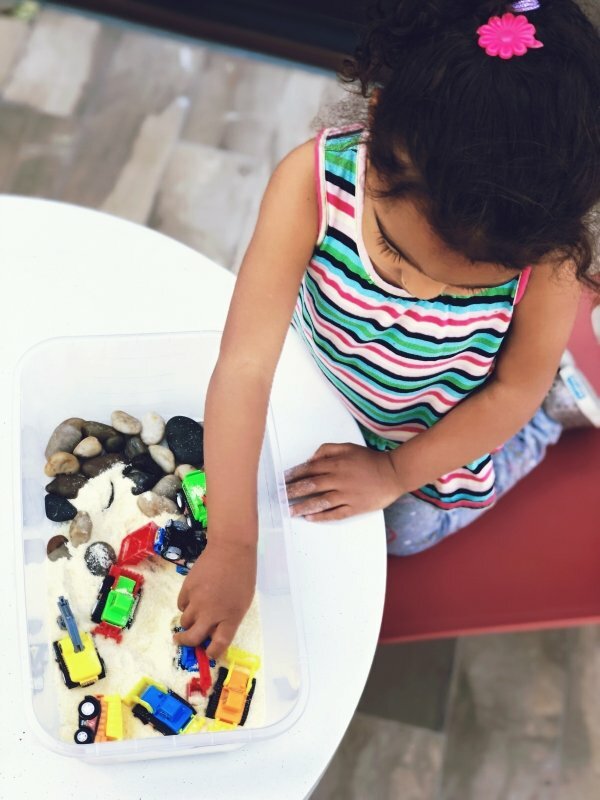 If you decide to try this sensory bin project, I’d love to hear about it! Tag me on Instagram @trombetta_tales or simply leave a comment on this post! 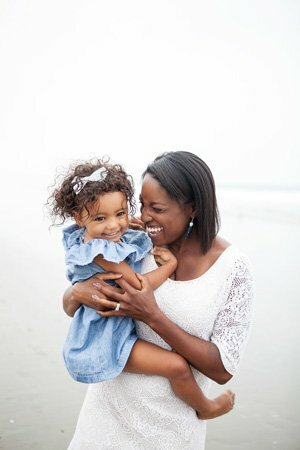 This is great and I love the connection to this sweet story. Thanks Emily! We love it too and I know we’ll be reading this one for a long time. Thanks for reading my post and leaving a comment!